Aquarium Filtration covers a wide range of salwater aquarium supplies and reef equipment. Prrotein skimmers, media reactors, filter media, live rock, and sand. We carry a huge selection of aquarium filtration and skimmers in stock. Having a good protein skimmer and filter media can make keeping your aquarium easier to maintain. Filtration is one of the most important parts of your saltwater aquarium during the aquairum setup process. 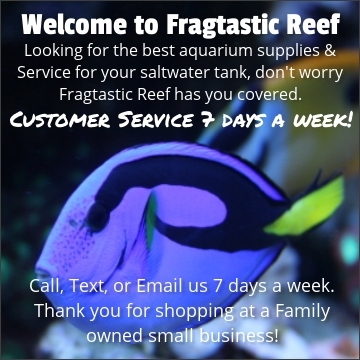 Fragtastic Reef carries everything you will need for your saltwater aquarium and the filtration to keep it going. Protein skimmers, live rock, live sand, and even RO/DI systems are all available on our website. We make sure you will have the proper supplies and options available for your reef filtration which will make you more successful. We carry one of the largest and best selections of protein skimmers, and can help you get the correct one for your aquarium filtration needs and reef tank setup.